Brief Description: The Cleveland House is a historic 1906 Bozeman south-side home with great recent renovations both inside and out. It's in a lovely neighborhood of older homes and quiet streets, walking distance to both downtown and Montana State University. With a combination of antiques, modern furnishings and interesting original artwork, this home has a relaxed upscale feel. Bedrooms and baths: The home has three bedrooms and two and a half baths. The master bedroom has a queen size bed and a beautiful attached bathroom with both a walk-in shower and claw foot tub. The other two bedrooms share a full bath with a tub/shower combination. The third bath is a powder room on the main level. 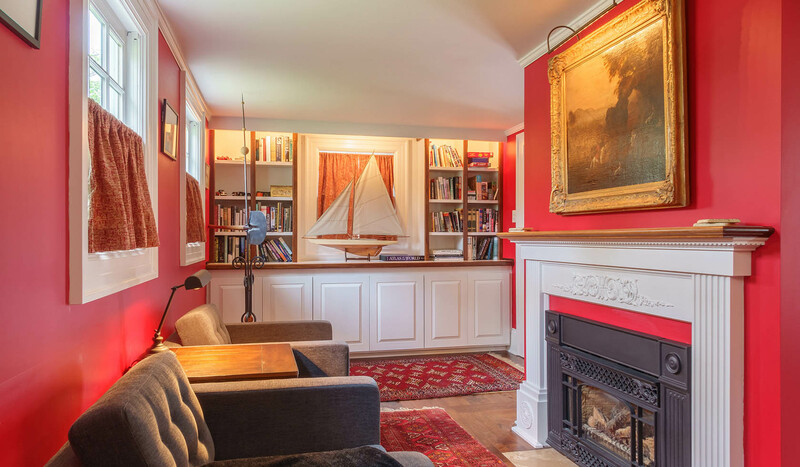 Living room: The living room and attached library are both comfortably furnished and each has beautiful fireplace. (The library's is gas fired, the living room is decorative only). The living room opens to the back yard so you can get a nice breeze through on summer evenings. The living room has a TV with cable service and a great collection of DVDs, as well as a stereo system with CD collection and in-ceiling speakers throughout the house. Kitchen: The kitchen is very well equipped and includes a microwave, dishwasher, a wine cooler and a walk in pantry. There's also a free standing gas fireplace between the kitchen and dining area to make it cozy on chilly winter mornings. Dining area: The dining room is just off the kitchen and has seating for eight guests. There are also stools at the kitchen bar for overflow, and there is a picnic table in the back yard for outdoor meals. Setting: The home sits on five city blocks in a quiet historic neighborhood on the south side of Bozeman. You are walking distance to a wonderful local market, to the MSU campus and to downtown. It's a great location! Outdoor Amenities: There are chairs and a gas barbecue grill on the back deck, a picnic table in the yard, and a huge back yard for an in town home! Activities nearby: Bozeman is a mecca for outdoor activities. You're just a few blocks from our wonderful trail systems for biking and walking. Mountain hiking and whitewater rafting are nearby. There's fishing on the nearby East Gallatin and main Gallatin Rivers, horseback riding, tours of Yellowstone National Park and more. The home is about an hour and a half scenic drive from Yellowstone's entrances at both Gardiner and West Yellowstone. Closest town and airport: You're about ten blocks from Bozeman's Main Street (a beautiful walk through the historic neighborhoods) and about 9 miles from Bozeman's Gallatin Field Airport.